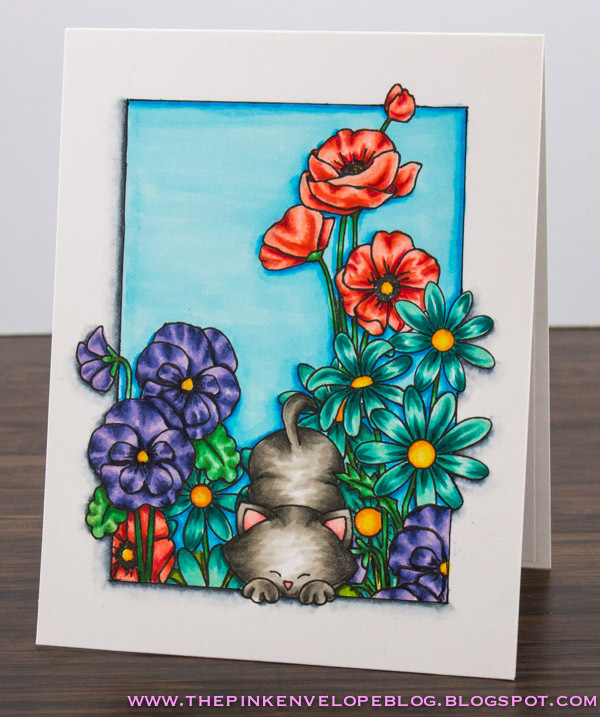 Today we have our first post from our July Guest Designer, Cynde Whitlow! We are thrilled to have Cynde designing with us this month! Her amazing ability to combine images to make unique scenes is definitely going to inspire you! We can't wait to share what she creates with our stamps! Keep reading to find out more about Cynde today and to check out her first project below! My name is Cynde and I live in the beautiful state of Montana. I’m married to my first love and together we have 4 kids. We also have a feline fur-baby named Ginger. My family is a lot like the Brady Bunch, if they'd been an 80's hair band. For real. I've always had the creative bug. In fact, I was that kid who had an imaginary friend and I thought purple horses were the bomb in kindergarten. I've been cardmaking for a little over 2 years and my blog is The Pink Envelope. I LOVE every bit of blogging. Sharing what I make and inspiring other folks is an amazing thing! My favorite type of cards to make are one layer cards that I can build up with lots of masking and color it all in with Copic's. My other crafty kryptonite is ink. I have more than what any one person should have, but they are all fab, so I tell myself I need them. Seems reasonable. I'm SO excited to be guest designing for Newton’s Nook and I look forward to sharing what I’ve created with you all! I'm super duper happy to be guest designing for the Newton's Nook Blog this month! Today's post is one of four I will share and I can't wait to share them all! One of my favorite things about Newton is that he makes for a great scene. Whether you take any Newton Stamp Set and use it as is or pair him with other fabulous images, you've got yourself a story to tell. For my card today, I paired up several stamp sets. 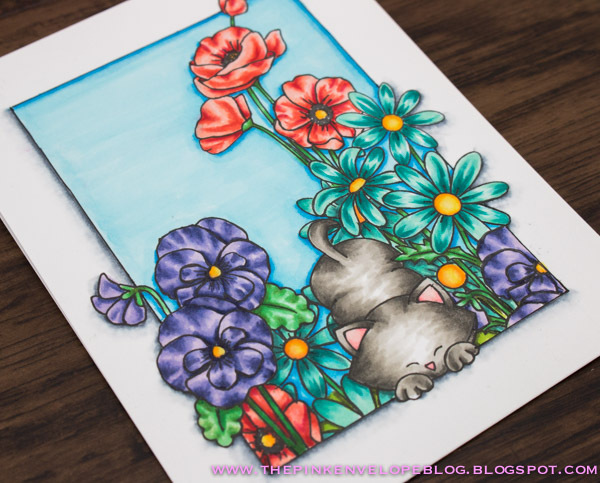 I started with some images from the Garden Starter and Flower Garden Stamp Sets. I knew that I would be doing quite a but if masking so I stamped and cut those out first. Before I started stamping any of the images on my white cardstock panel, I used a ruler and lightly traced a rectangle on the front with a pencil. This will be my faux frame. I'm also going to use this as a guide so I know where to stamp my images. When stamping scenes like this, it's always important to stamp the images that are going to be in the front or foreground first. With this card, I needed to keep in mind what images I wanted in front, but also which ones I wanted to go outside the faux frame and the ones I wanted to stay inside the frame. For those that need to stay in the frame, I simply blocked off the outer edge of the frame with more masking paper. 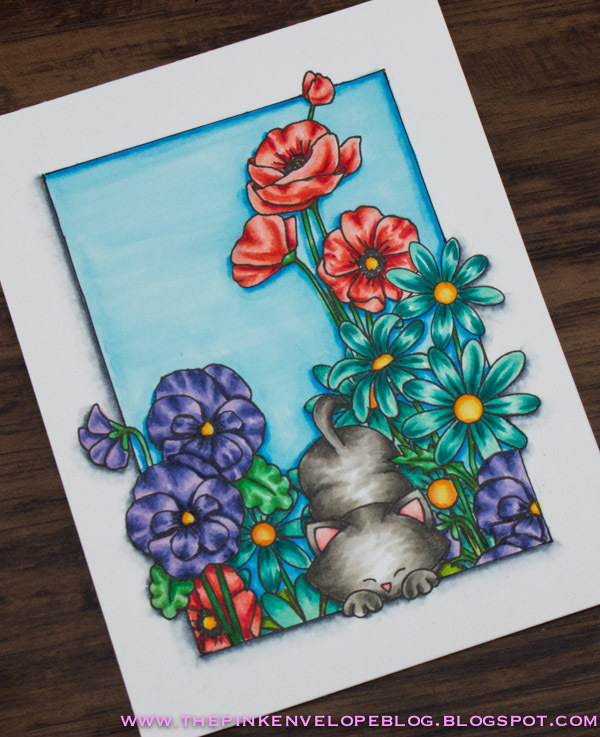 The mischievous feline I chose to go with those big beautiful blooms is from the Newton's Antics Stamp Set. I LOVE how he looks like he's ready to pounce! When I had everything stamped where I wanted it, I colored it all in with Copic's. I adore big, bold color folks. It's go big or go home in my crafty world. Plus, I really wanted the whole scene to jump off the page. Using a Copic Multiliner, I went over the faux frame again and added shading with my grey Copic's. The idea is to make it look like it's another layer to the card. There's no need for embellies on this card peeps. However, to finish off my panel, I used Clear Wink Stella on the highlights of the images and Ranger Glossy Accents on the center of all of the flowers and called it a day. I hope you enjoyed my card today and thanks so much for stopping by to see me! This card is just stunning!!! Amazing coloring and design!